Dignity factory workers in Accra, Ghana, producing shirts for overseas clients. The company aims to enhance worker-factory relationships by providing free, good-quality meals, an in-house clinic, and efforts to create a social life for workers. The High-Level Panel on Women’s Economic Empowerment held its inaugural meeting today at the United Nations Headquarters in New York, where the 60th session of the Commission on the Status of Women is underway this month. Addressing a room of prominent leaders from government, business, academia and civil society, Secretary-General Ban Ki-moon said the group can collectively lead the charge for women’s economic empowerment. 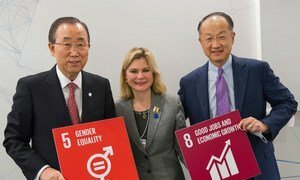 “Women and girls deserve the same access to quality education, economic resources and political participation as men and boys,” Mr. Ban said, noting this is both the global agenda and his own personal philosophy. Women and girls “must also enjoy the same employment, legal rights, leadership and decision-making opportunities,” he added. Launched at the World Economic Forum in Davos this January, the Panel is expected to provide recommendations linked to the 2030 Agenda for Sustainable Development on how to improve economic outcomes for women and promote their leadership in driving sustainable and inclusive, environmentally sensitive economic growth, according to UN Women. The Panel, which is co-chaired by Costa Rican President Luis Guillermo Solis and Simona Scarpaleggia, the CEO of IKEA Switzerland, will produce the first report this September, followed by a final report in March 2017. According to Mr. Ban, the Panel is strategically positions to demonstrate high-level leadership and commitment to realizing women’s economic empowerment; to set priorities for accelerating women’s economic empowerment, and to demonstrate how they are already being successfully carried out; and to serve as examples of how government, business, civil society and development partners can join forces for women’s economic empowerment. The Panel is backed by the UN Women, the UN International Labour Organization (ILO), the International Monetary Fund and the World Bank, with support for its work provided by the UK Department of International Development. Today’s meeting took place on the second day of the CSW, the principal global intergovernmental body exclusively dedicated to the promotion of gender equality and the empowerment of women. The priority theme for the 60th session is women’s empowerment and its link to sustainable development.